The NYC subway showcases America’s diversity, so how come the people who occupy those seats are so different from those occupying the seats of Congress? The U.S. Congress has 535 seats, with 435 representatives and 100 senators. We placed stickers on the R train, part of the NYC public transportation system. It runs from Queens to Brooklyn, going through Manhattan, and it’s one of the city’s most diverse subway lines. 51 of 535 seats in the U.S. Congress are occupied by African Americans. If these numbers were proportional to the U.S. population, 72 congressional seats and 9 subway seats would be occupied by African Americans. of the 70 SEATS WOULD BE OCCUPIED BY WOMEN. 112 of 535 seats in the U.S. Congress are occupied by women. If these numbers were proportional to the U.S. population, 272 congressional seats and 26 subway seats would be occupied by women. of the 70 SEATS WOULD BE OCCUPIED BY Latino Americans. 46 of 535 seats in the U.S. Congress are occupied by Latinos. If these numbers were proportional to the U.S. population, 97 congressional seats and 13 subway seats would be occupied by Latino Americans. 18 of 535 seats in the U.S. Congress are occupied by Asian Americans. If these numbers were proportional to the U.S. population, 31 congressional seats and 4 subway seats would be occupied by Asian Americans. of the 70 SEATS WOULD BE OCCUPIED BY people under 40. 19 of 535 seats in the U.S. Congress are occupied by people under 40 years old. If these numbers were proportional to the U.S. population, 107 congressional seats and 14 subway seats would be occupied by people between 25 and 40 years old. 7 of 535 seats in the U.S. Congress are occupied by those who identify as LGBTQ. If these numbers were proportional to the U.S. population, 24 congressional seats and 3 subway seats would be occupied by LGBTQ people. of the 70 SEATs WOULD BE OCCUPIED BY People born outside of the U.S.
23 of 535 seats in the U.S. Congress are occupied by people born outside of the country. If these numbers were proportional to the U.S. population, 71 congressional seats and 9 subway seats would be occupied by people born outside of the U.S.
Voting is very important, but it's not enough. In order for real change to take place, there must be more diversity amongst candidates running for office. Are you thinking of running or do you know someone that is? There are many NGOs that promote a more inclusive democracy, offering training and support to those who want to run for office. Visit some of them through the links below. 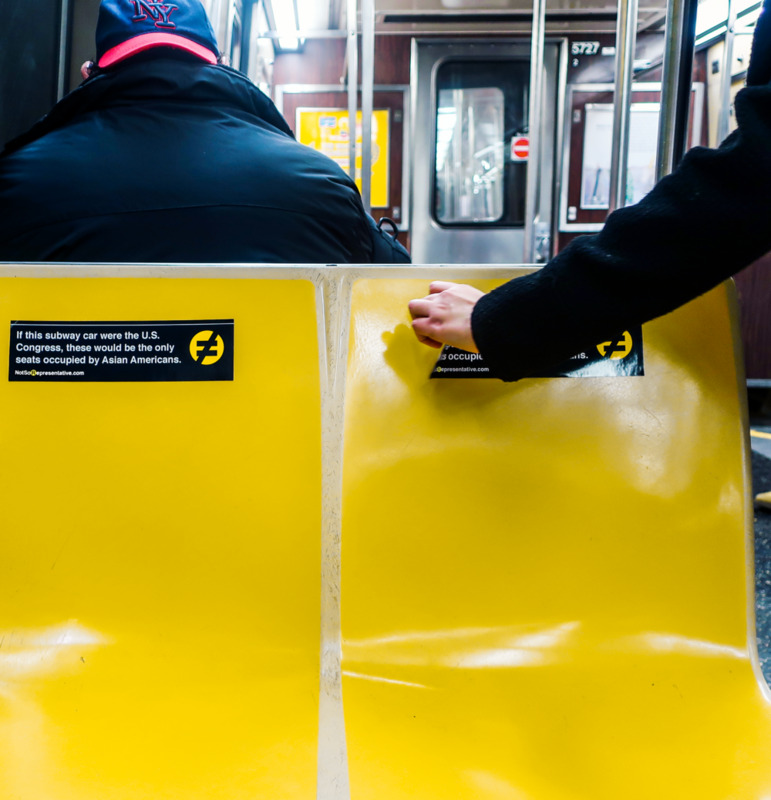 **Once the project was complete, all stickers were removed and all subway seats were cleaned.